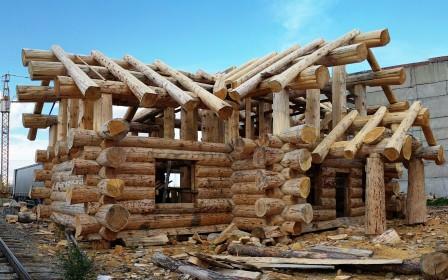 The use of log houses in private construction is quite promising, presentable and profitable. The house made of big cedar is not inferior in quality characteristics to classical types of buildings, and in many respects even surpasses them. This direction assumes the use of an exceptionally high-quality, environmentally friendly and selective log more than 50 cm in diameter. The width of the longitudinal groove in such logs is not less than 20 cm. ventilating the grooves and bowls - fresh grooves should dry before joining to absorb the protective layer. Unscrupulous masters when building a house from cedar of large diameter often miss the last stage, as a result of which the moisture-protecting agent is not absorbed into the damp tree, and the insulation has to be laid in a moist environment. This negatively affects the life of materials and the house itself. Our company uses exclusively high-quality, selected and past all stages of wood. Logs are harvested in winter, when the biological activity of the tree is reduced and minimal harm is done to it. If necessary, specialists of our company will develop a design for your home, help you choose and arrange the furniture, choose the finishing materials. We work with ready-made or customer-supplied projects. The price of a house made of large diameter cedar depends on the area, layout, selected materials and terms of implementation. For detailed consultation fill in the application form for construction of a log house of cedar.